Go Digital presenter, Gareth Mitchell, reports from the midst of one the biggest ever online events. Thursday sees the web and particle physics equivalent of Live 8, as scientists and computing pioneers from around the world hook up for a 12-hour live webcast. The headline acts include Stephen Hawking, Nobel laureates Leon Lederman and Murray Gell-Mann and web founding father Tim Berners-Lee. 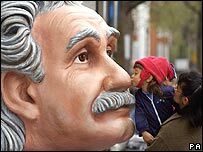 The webcast, called Beyond Einstein, is one of many events this year to mark the centenary of Einstein's theory of relativity. Alongside E=mc², there will be discussion of gravitational waves, the search for the Higgs Boson and the mysteries that still linger behind Einstein's work. The hub of it all is the European particle physics lab Cern, just outside Geneva, appropriately, the birth place of the world wide web. Among the contributors is Robert Cailliau who played a crucial role in the birth of the web. In London, the webcast will be coming from a TV facility at Imperial College. One of our guests is Peter Kirstein. Now an eminent computer scientist at University College London, he laid the foundations for the internet in the 1970s. He tried to persuade sceptical funding bodies and government that the net might just catch on one day. The webcast also includes discussion of Grid computing. When protons smash into each other in Cern's new Large Hadron Collider, data from the collisions will require number crunching on a massive scale. Grid supremo Carl Kesselman is joining the webcast via the webcam in his California office to explain how big processing jobs are farmed out to computers all over the world. It is the technology equivalent of coordinating hundreds of mechanics around the globe to build a very big car. Will it all work? Somewhat harassed engineers in the Geneva control centre are confident it will, as they juggle frame rates, connection speeds and IP addresses from video conferencing suites and webcams all over Europe, America, Asia, Africa and even Antarctica. The big question is whether anyone will bother watching it all. For all but the most hardened geek, 12 hours of neutrinos and networking in a small window on your computer screen is not quite the same as a day's musicfest a la Live 8. Millions stayed with Live 8 for the whole thing. The audience for this webcast is more likely to dip in and out. And, Beyond Einstein is to be an interactive event. Throughout the webcast, viewers will be invited to put their questions and comments to the big names via the Cern website. 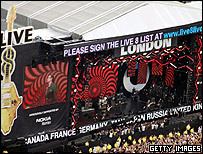 Live 8, may have been more music than muons, but there was no way of having a live webchat with REM or U2.